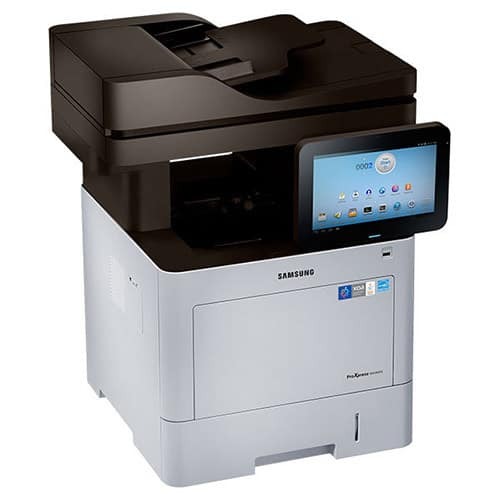 Samsung M4580FX Monochrome Multifunction ProXpress - Perfecta Business Services, Inc.
Samsung’s new multifunction printer (MFP), the ProXpress M4580FX, provides smart usability that allows users to work faster and more efficiently using intuitive, easy-to-use controls. And with high-performance and resource-efficient features, this MFP can meet the printing needs of workgroups that depend on reliable, cost-competitive document handling solutions, while lowering total cost of ownership (TCO). The Real Preview function is available in preloaded applications, such as Copy, Send and Box. Usability can be further extended with the built in Web Print Browser, which allows you to quickly print content such as maps, pictures, e-mail and more without a PC. Access even more useful features and solutions by downloading them through the Samsung Print App store. Android printing User Interface (UI). This user-friendly interface provides intuitiveness, usability, and extensibility. Applications are preloaded, including Copy, Scan/Send, Box (Document Storage), Job Status, Counter, Settings, Build Job, Address Book and Help, which provide users with more convenient usability. In addition, there are custom widgets for creating instant, one-touch access to frequently used functions. Enhance the UI by arranging and managing the environment per user with My Page. Simply customize the settings and Quick Menu for each user, and keep track of an individual’s usage, control accessibility and more. Administrators can create custom shortcuts directly on the device. Instantly perform complex tasks with one click by customizing the interface configuration.